Bernhard Riemann was a German mathematician who was the first person to provide a thorough treatment of non-Euclidean geometry and to see how it might be applied in physics. He thus helped pave the way for Einstein's general theory of relativity. Among several other profound aspects of mathematics now named after him are the Riemann hypothesis and the related Riemann zeta function. Riemann was encouraged by his father, a Lutheran pastor, to study theology at Göttingen. 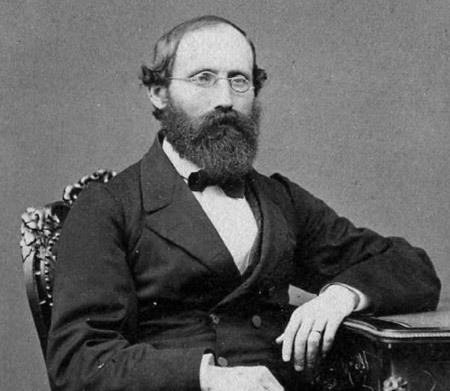 But even as a child Riemann had shown a tremendous aptitude for mathematics and, in 1847, he persuaded his father to let him go to Berlin to learn mathematics from the likes of Karl Jacobi, Peter Dirichlet, and Jakob Steiner. Two years later, he returned to Göttingen to study for his Ph.D. under the great Karl Gauss and begin his climb up the professorial ladder. In 1853, when Gauss was seventy-six, his star pupil Riemann had to give a lecture to confirm his position as a faculty member. It was the tradition in such circumstances to offer three possible topics, but that the choice of topic would be made between only the first two. Not surprisingly, given this normal course of events, Riemann hadn't fully prepared for his third choice: the foundations of geometry. Gauss, however, couldn't resist the prospect of hearing his wunderkind speak on a subject that he (Gauss) had grappled with for much of his life, and so he asked Riemann to deliver his third topic. After several postponements, Riemann gave his lecture "On the Hypotheses Which Lie at the Foundation of Geometry" in June 1854. It proved to be a triumph and included a workable definition of the curvature of space and how it could be measured, the first description of spherical geometry (see elliptical geometry), and, most important of all, the extension of geometry into more than three dimensions with the aid of algebra. Earlier in his career, Gauss had published results in which he hugely advanced the theory of surfaces in two dimensions. He'd shown that it isn't necessary to consider a two-dimensional surface, such as a sphere, to be embedded in a three-dimensional space in order to define its geometry. It's enough to consider measurements made entirely within that two-dimensional geometry, such as an intelligent ant, forever restricted to live on its surface, might make. The ant would know that the surface was curved by measuring that the sum of the internal angles of a large triangle differs from 180 degrees, or by measuring that the ratio between a large circumference and its radius differs from 2π. As a result of his study of surfaces, Gauss gave a precise mathematical meaning to the idea of curvature and a way of evaluating it. So-called Gaussian curvature is positive on the surface of a sphere, negative at every point on a saddle-shaped surface such as a hyperboloid, and zero for a plane. It thus determines whether a surface has elliptic or hyperbolic geometry. But Gauss didn't confine his thinking to a curved two-dimensional surface floating in a flat three-dimensional universe. In a letter to Ferdinand Schweikart in 1824, he dared to conceive that space itself is curved: "Indeed I have therefore from time to time in jest expressed the desire that Euclidean geometry would not be correct." This brilliant inspiration was to take root in the mind of Gauss' most talented apprentice. Riemann extended Gauss' work to spaces of any number of dimensions and put on a firm footing the type of non-Euclidean geometry that Gauss had hinted at, the kind known as elliptic geometry, in which there are no parallel lines and in which the angles of a triangle always add up to more than 180 degrees. He also generalized the notion of the shortest distance between two points. In Euclidean geometry this is simply a straight line. But step out of Euclid's domain and the quickest way to get from A to B involves a change of tack. The easiest way to grasp this idea is to think about traveling on Earth's surface, which isn't flat but (roughly) spherical – a special case of Riemann's elliptic geometry. To take a ship on the shortest route between two ports you sail, wherever possible, along an arc of a great circle – the circle that goes all the way around the Earth and on which both ports lie. Any such minimum-length path on a surface, the special case of which on a plane is a straight line, is called a geodesic, meaning "Earth divider." In Euclidean geometry, the shortest distance between two points can be found using Pythagoras' theorem. What Riemann discovered was a more powerful, general form of Pythagoras' theorem that works on curved surfaces, even when the curvature is in more than two dimensions and varies from one place to another. In this looking-glass world of curved space, the familiar idea of distance is replaced by the broader concept of something called a metric, from the Greek for "measure," while curvature is similarly described by a more elaborate mathematical object. Gauss had found that the curvature in the neighborhood of a point of a specified two-dimensional geometry is given by a single number: the Gaussian curvature. Riemann showed that six numbers are needed to describe the curvature of a three-dimensional space at a given point, and that 20 numbers at each point are required for a four-dimensional geometry: the 20 independent components of the so-called Riemann curvature tensor. Space [in the large] if one ascribes to it a constant curvature, is necessarily finite, provided only that this curvature has a positive value, however small... It is quite conceivable that the geometry of space in the very small does not satisfy the axioms of [Euclidean] geometry... The properties which distinguish space from other conceivable triply-extended magnitudes are only to be deduced from experience. So far ahead of his time was Riemann that, having arrived at his great mathematical description of space curvature, he began working on a unified theory of electromagnetism and gravitation in terms of it. Riemann grasped that forces might be nothing more nor less than a manifestation of the geometry of space. Flat beings on a wrinkly two-dimensional landscape, like that of a crumpled sheet of paper, would, when they tried to move around, experience what felt to them like gravitational effects. By analogy, he reasoned, forces in our world might best be explained in terms of warps in a higher dimension. And the effect would work both ways. If space told mass how to move, then space must itself – by the principle of action and reaction – be affected by mass. Physicists were still far removed from such a way of thinking: space was still, for them, a rigid, homogeneous something, susceptible of no change or conditions. Only the genius of Riemann, solitary and uncomprehended, had already won its way by the middle of the last century to a new conception of space, in which space was deprived of its rigidity, and in which its power to take part in physical events was recognized as possible. One major obstacle had blocked Riemann's further progress. He thought only of space and its topography. Einstein's great epiphany was that, in building a new theory of gravity, he also had to deal with time – with spacetime and spacetime curvature. A Riemann surface, also known as a complex curve, is a complex manifold with one complex dimension. It is a conformal structure. The Riemann sphere, an example of a Riemann surface, is a topological sphere consisting of the complex plane and the point at infinity.